UK-based glass manufacturer Beatson Clark has invested about £3m to upgrade its South Yorkshire glassworks facility. Bottero individual section (IS) machines have been installed at two of the company's manufacturing lines to improve the glass bottles production capacity. Capable of carrying out operations round the clock, the machines will be used to produce glass containers for various food brands including English Provender and Mackays, as well as for some of the major UK retailer’s own brand products like spice jars. Installed by ECO Engineering, the machines can produce an average of 160 million white flint bottles and jars annually. Beatson Clark project management head Graham Lax said: “These new eight-section double gob machines represent the latest generation in servo controlled equipment. The upgrades also include installation of machine and mould cooling fans which was carried out by Integrated Air Systems. 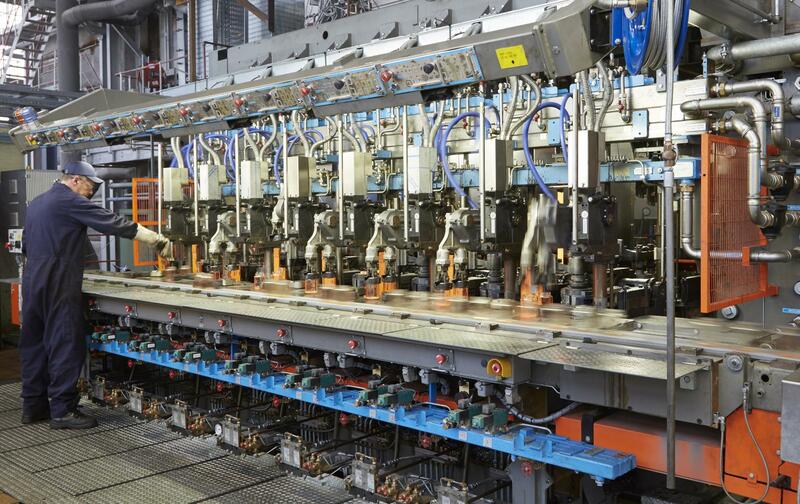 In September 2016, the company installed two new palletisers on its amber glass lines to enhance production and flexibility. A total of £720,000 was invested to install the new Zecchetti conveyor line and palletiser which are which are designed for both bulk and small pack operations. Image: Beatson Clark’s glass bottle manufacturing facility. Photo: courtesy of Beatson Clark.